Grammarly is the top online writing tool that can improve productivity especially when it matters. And if you are the type of writer who uses a lot of Microsoft Office, it would be best to add Grammarly to Word. And you arriving here is exactly what’s about to go down. Grammarly to Word is probably the best combination of writing tools that ever happen to the age of computers for writers. Well, at least that is the case for all writers whether aspiring or professional. Anyone can write better and more efficient with Grammarly. Grammarly offers free trial service to their users for a limited period. In case if you want to continue using Grammarly then they have a premium service which is paid. We have posted about 3 ways to get grammarly premium free. Before you start using Grammarly premium check the Grammarly review 2019 from 501 words . If you are using Grammarly with only the web version, there is a better way to integrate this tool on your writing activities. 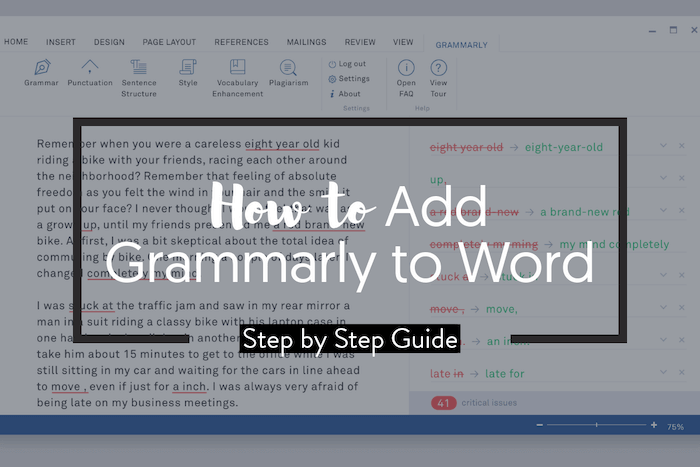 In this article, we will give you the easy and quick way to install and add Grammarly to Word. We can make it a native extension of the Microsoft Office suite. And if you don’t like it, you can easily uninstall Grammarly as well. First of all, make sure to close any Microsoft Office app especially the Word. Now, right-click to this link and open to new tab using this web browser that you are currently using. Below is the “Free Download” button. Click on it to initiate downloading the “GrammarlyAddInSetup” installer. A Welcome page will pop-up. Click on the “Get Started” button. On the next page, you will be given two choices. Grammarly for Word and Grammarly for Outlook. You may choose both if you use Outlook. If not, just uncheck the Outlook and make sure to have the Grammarly for Word ticked. On the bottom right corner of the installer, click on the “Install” button to start the installation. Once the installation is through, it will ask you to login your Grammarly account if you already have one. Or sign up if you have not yet created any. That’s it. You may now launch Microsoft Office. You have now added Grammarly to Word. You may now start writing with less worry of wrong spelling, misplaced punctuations, and even better grammar. You can always use Grammarly for free, but the best features are only activated on the Grammarly premium version. That means if you are using Grammarly professionally or for business purposes, we suggest to maximize this writing tool service. Get the premium version now. We hope that this article has been of great help. Feel free to share your thoughts in the comment section. If you have questions, you may leave it as well down below.